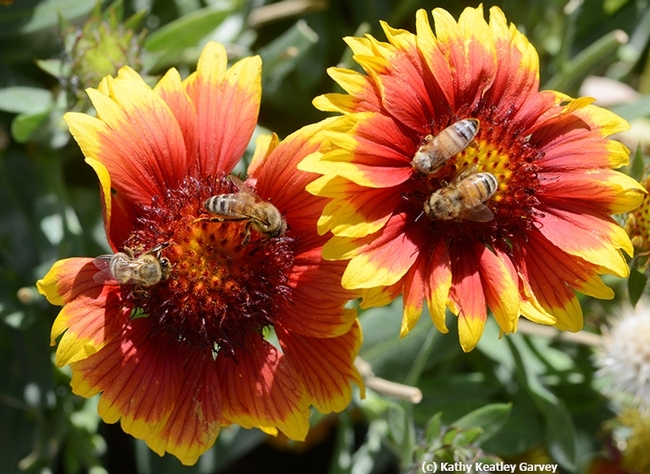 Let's hear it for the honey bees. Right now they're scrambling to gather nectar and pollen from the blanket flower, Gaillardia. You could say they're blanketing the flower. When resources are scarce in the fall, the blanket flower, in the sunflower family Asteraceae, draws them in. The flower reminds us of Native American Indians' brightly colored and patterned blankets. Now let's hear it for the California State Beekeepers' Association (CSBA). They're delivering and gathering knowledge at their annual conference, being held Tuesday, Nov. 15 through Wednesday, Nov. 17 in the Kona Kai Resort and Spa, San Diego. They'll discuss the latest research, trade ideas with fellow beekeepers (note that "beekeepers" are "keepers") and they'll explore some of the innovative products at their trade show, a spokesperson said. Among the speakers are two UC Davis-affiliated specialists: Extension apiculturist Elina Niño, who will key in on the research underway at the Harry H. Laidlaw Jr. Honey Bee Research Facility, and Extension apiculturist emeritus Eric Mussen, who will offer a glimpse of the present, past and future of beekeeping. Niño's research interests encompass basic and applied approaches to understanding and improving honey bee health and particularly honey bee queen health. Ongoing research projects include understanding the synergistic effects of pesticides on queen health and adult workers in order to improve beekeeping management practice, as well as testing novel biopesticides for efficacy against varroa mites. Keep up with the Niño lab on its Facebook page. And keep up with CSBA on its Facebook page. Mussen, who retired in 2014 after 38 years of service--but maintains an office in Briggs Hall--is guaranteed to add some humor to his talk. How do we know? We saw his PowerPoint before he left Davis for San Diego. Hint: replace "dog" food with "bee" food. And the insect in his last slide doesn't look anything like the bee we know and love. to support the economic and political viability of the beekeeping industry. It's all about "bee-ing" there for the bees.